The best salsas are homemade. Guacamole is best made at home, too, from your personal favorite blend of herbs, spices, and vegetables. My recipe is a sacred tradition, assembled from at least a dozen hours scraping various online blogs for hidden grains of wisdom. It’s still a work in progress, but I get lots of compliments whenever I’m the one bringing dip to a gathering. One of my best-kept secrets is the use of a molcajete, or a traditional Mexican mortar and pestle. These rough tools do something to herbs and spices that you can’t really replicate with other tools. Not only do they achieve a wonderful grind, they also carry over a little bit of flavor from one preparation to the next. This means that salsa prepared in my molcajete will taste different from salsa prepared in yours. This little quirk makes my molcajete one of my favorite tools. I use it for salsa, guac, dry rubs, and anything else I want to taste like my signature spice blend. If this sounds like something you’re interested in, here are a few of the best molcajetes you can find as of right now. Molcajetes can be found from authentic vendors in Mexico, but you don’t have to travel that far. The best way to purchase one is probably via Amazon. Not only can you take advantage of Prime shipping and online sales, you also get one delivered to your door without any effort at all. If you’d prefer to find one locally, several retailers carry rough mortar and pestle sets that are fairly close to molcajetes in terms of performance. Bed Bath and Beyond, Target, and Walmart have carried products I’d consider “close enough” in the past. Be sure to call ahead or check an online catalog before you leave the house. Molcajetes are traditionally handmade from rough basalt. This tool is no different. It’s constructed from porous lava rock, giving it all of the properties of an old-school molcajete. You’ll need to season and prepare it, of course, but that’s half of the fun. This is one of the larger molcajetes on the market, which is one of the reasons why it’s my top pick. It’s got a capacity of about 3 cups, with an exterior diameter of 8 inches and an interior diameter of 6.5 inches. You’ve got plenty of space to grind all of your spices in the large, porous bowl. While I’m very much of the opinion that this is an “authentic” molcajete, there are some people who think it’s not. This is because it’s made from the “wrong” type of basalt. It’s made from a lighter grey volcanic rock, not the dark, smooth basalt you’d find in Mexico. This doesn’t impact performance at all, just the color of your molcajete. For me, any stone instrument made of porous volcanic rock qualifies, regardless of the color. To be clear, you have to finish smoothing out the inside of this molcajete bowl yourself. The process will take quite a lot of time. I’d suggest starting with sandpaper until it’s fairly smooth. After that, start grinding rice with the pestle inside the bowl until little bits of basalt stop appearing in your ground rice. Once that’s done, you should be all clear to start grinding spices. For some people, this process can take more than a day. Not 24 hours of work, mind you, just a bit of grinding until your hand gets sore over the course of a couple days. After that, it’ll be all set to use for whatever spices and recipes you want to grind. One thing to note: anything that you put into this molcajete will remain in the bowl, flavor-wise, for a long time. This means you should avoid grinding things that you don’t want to taste or using non-food safe cleaning solvents in your molcajete. The molcajete bowl will retain all of the flavors it comes into contact with and pass them on to your next batch of guacamole. If you’d like an affordable, authentic molcajete made from real volcanic basalt, this one is a top pick. For more options, keep reading! This 8″ molcajete is quite similar to the one above. The big difference here is price: while both of these tools are made from authentic lava rock that’s handcrafted by Mexican craftsmen, this one is a bit more expensive at the time of this writing. The difference isn’t very big, however, and online prices tend to vary, so be sure to check out both. All of the upsides and downsides of the previous product still apply here. Preparing and seasoning the molcajete is still time-consuming. 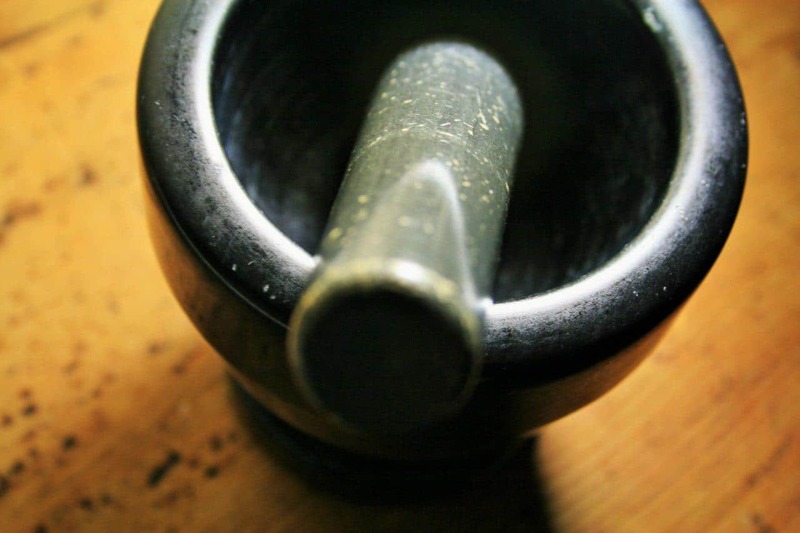 The porous surface of the molcajete mortar and pestle still absorb flavors, meaning you’ll build up a unique, characteristic flavor each time you use it. It’s not particularly difficult to care for, however, and you can make delicious guacamole, salsa, and other spice blends with ease in this tool. If you prefer the price on this product to the one above, it’s a great purchasing decision. You’ll enjoy the tasty foods you can make in the authentic basalt bowl of this molcajete. Like the two options above, this tool is made from porous rock and is designed in a traditional Mexican fashion. It’s quite similar in all the ways that matter. Essentially, what you’re paying for with all three options so far is a rough-hewn bowl of volcanic rock. There’s not a lot more to look for, nor is there much more included. All three options arrive unfinished, meaning you’ll want to sand out the inside and grind some hard things (like rice) in order to ensure you don’t wind up with bits of basalt in your salsa. Again, this tool will require careful cleaning, or rather, it’ll require careful not-cleaning. It’s difficult to remove dish soap from your stone molcajete should you get any inside. The porous surface can trap flavors and aromas for quite a long time, meaning that your salsa and guac will taste a little bit like soap for a while afterward, even if you rinse very, very thoroughly. The biggest difference here is that this product is perhaps a half inch taller than the other two. Otherwise, feel free to let online sales dictate your purchasing decisions. 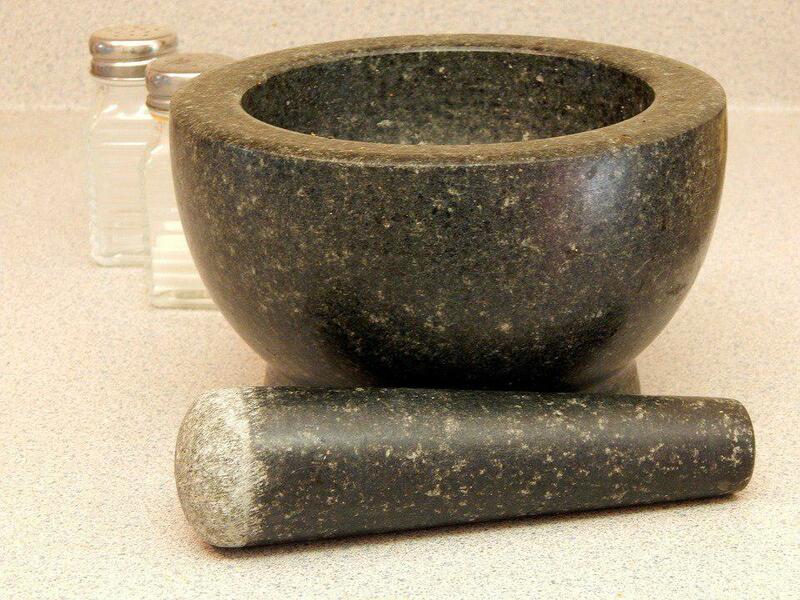 If you don’t want to sand your own stone bowl, this granite mortar and pestle comes pre-sanded and ready to use. It’s not quite as porous as an “authentic” molcajete, but this won’t make that big of a difference when it comes to making your favorite hand-mashed dishes. 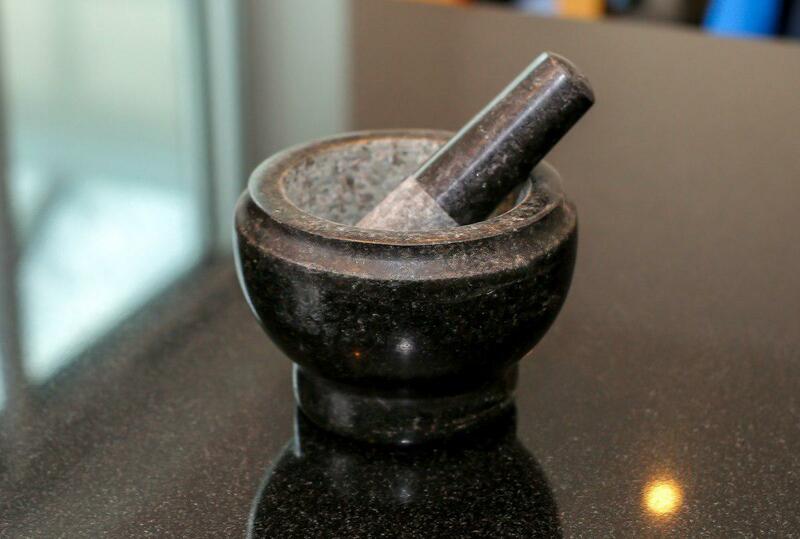 One important thing to note is that while granite isn’t quite the same as the volcanic rock in an authentic molcajete, it’s still porous enough to be seasoned by your favorite spices and flavors. This means you’ll want to avoid soaps, just like with a traditional molcajete. 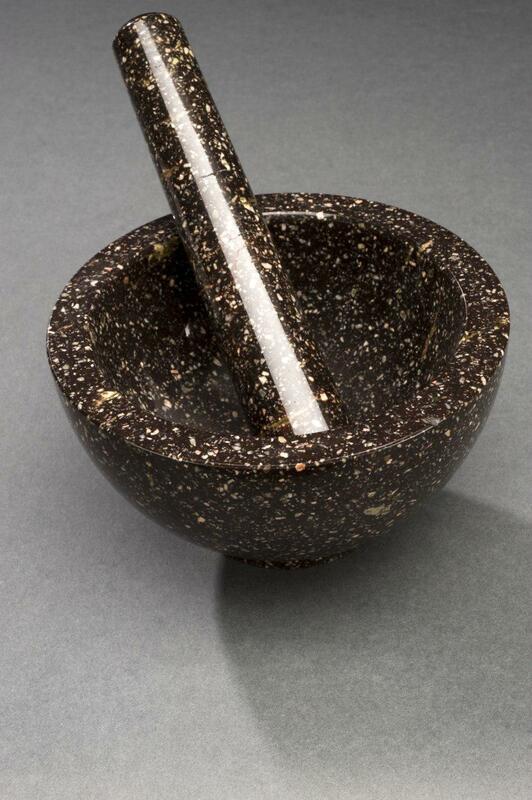 Truthfully, the difference between this granite product and a volcanic molcajete is small enough that you can feel good about using this tool for even the most authentic Mexican dish. If you’re too busy to finish smoothing out the rough inside of an authentic molcajete, this tool comes much more ready to use right out of the box. You’ll still have to grind a 1/4 cup of rice or so to get out any loose stone dust, but this is far less than you’ll have to grind with an authentic product. When you get your molcajete, first, feel around the inside of the bowl with your hand. If it’s rough, you’ll probably want to sand it down a bit to speed up the process of preparing it. Take some sandpaper and simply sand out the inside of the bowl until it doesn’t feel especially rough. it won’t ever quite feel smooth, but you should be able to move your fingers around the bowl with no pain. Next, rinse out the bowl with some warm water. This will help remove larger particles of rock. The next step involves grinding lots of white rice. Throw about a quarter cup of white rice into the bowl and grind it until it’s a fine powder. Inspect the powder for chunks of rock. If there are any, discard the rice and repeat the process. It usually takes at least three repetitions of this process to get out most of the granite, but you may find that some molcajetes take even more time. Finally, grind some of your favorite spices. I’d suggest simply making something in the molcajete straight away, rather than grinding an esoteric blend of spices to simply discard. A garlic aioli is a perfect start, as is a salsa or a blend of spices for your favorite curry. Make sure it’s something you like. It’s your molcajete, so you want it to be seasoned with the flavors of your personal favorite herbs and spices. I’ve alluded to this above, but it’s important to repeat this: once you’ve seasoned your molcajete, clean it out with warm water only. If something terrible happens (like mold), clean it with something edible, like vinegar. If you’re worried about contamination, get a new molcajete. There’s no real way to disinfect inside the nooks and crannies of the porous surface. Instead, you’ll simply hide bits of soap inside your molcajete that will work their way into your next salsa or guacamole. To repeat: warm water only. Vinegar if you must. No soap. Don’t grind anything you don’t want to taste in your next recipe. To avoid mold, be sure to thoroughly air-dry your molcajete in between uses. Keep it in a dry place with plenty of direct light. The countertop is perfect. Many people, myself included, use their molcajete to store onions, garlic, and other food when it’s not in use. Once you’ve gotten your molcajete properly finished and seasoned, here’s a quick guacamole recipe you can use with it. If you’d like to garnish your guacamole, reserve about a tablespoon of chopped onion, tomato, and cilantro and simply sprinkle it on afterward. Combine onion, peppers, tomato, lime juice, garlic, and salt in your molcajete. 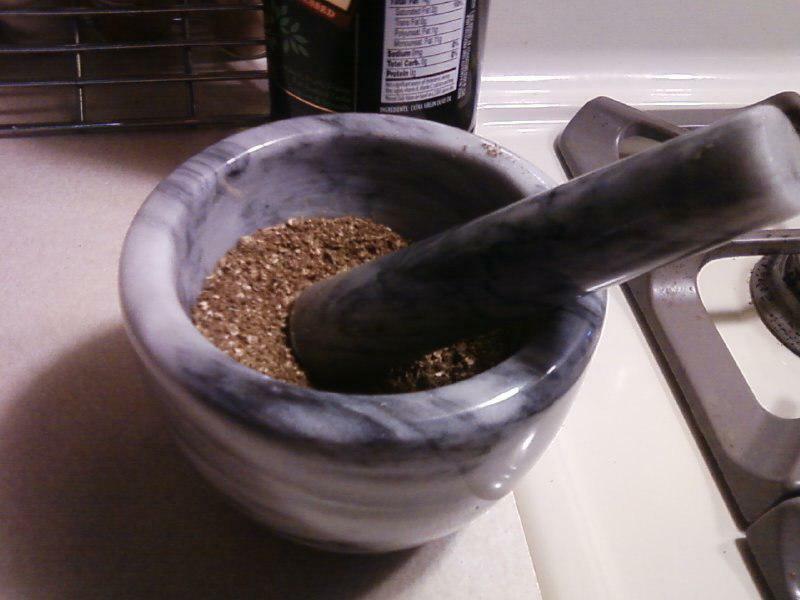 Take your pestle and smash this mixture until it’s coarsely ground and fairly well mixed. Peel and seed the avocados, then add to the bowl. You usually slice them in half, strike the pits with a knife, and lever them out. Next, either use a spoon to scoop the avocado flesh in the bowl or simply turn the skins inside out to pop out the flesh. Add the cilantro and any additional seasonings you want to add. Mash the mixture until it’s reasonably well mixed but still slightly lumpy. Take a chip and try your guac. Adjust the salt and other seasonings as needed. Garnish with any reserved ingredients. 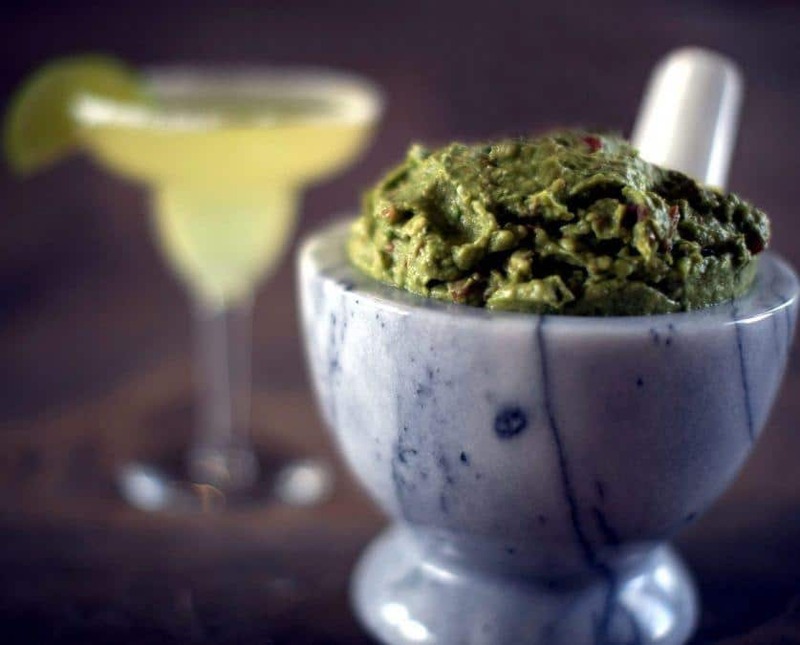 You can serve your guacamole right out of your molcajete for a wonderful rustic touch. I personally like to transfer mine to an airtight container to avoid oxidation while it sits in the fridge. Fresh guacamole will discolor reasonably quickly, so try to make this right before you serve it. There are lots of companies that make very authentic molcajetes in similar sizes at similar price points. All of the options above have been vetted by hundreds of happy customers and will make delicious, authentic salsa and guacamole as long as you’re willing to put in the work. Be sure to take your time with the seasoning process. You don’t have to do everything all at once. Simply grind a quarter cup of rice every day while you watch TV or talk on the phone until the rice comes out clean. Remember to care for your molcajete properly and avoid the use of soap and other things that don’t taste good. Over time, it’ll build up a memory of your favorite herbs and spices. This will make your recipies taste even more delicious and give them a unique flavor that can’t be replicated anywhere else.